The VMPRA was back racing in Warrnambool, a regional city on the West Coast of Victoria. The Field was in really good condition and the club was sporting some new structures in the form of a new club house and shed. The new club house was yet to be fitted out, so the guys from SA & NSW were allowed to set-up camp in there. 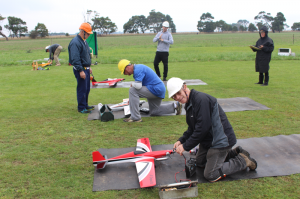 Travelling to Warrnambool on the Friday was a wet affair although conditions at the field where dry enough for setting up camp and to carry out some practice flights. Saturday was off to an early start and once setup and was completed, we started with F400. Five rounds were completed and by lunch. Next up was five rounds of FA1. The full Australian F3D 2017 World Championship team were present for this event so we got to see them in some of their final practice and preparations before heading off to Sweden in late July. By the time the FA1 racing had finished it was getting late. We started Q500 with a healthy field of 9 pilot and managed to complete 2 rounds before low light started to become a problem. After stopping for the day, the drizzle set in. Unfortunately, that was pretty much the weather for the whole night and most of the next day resulting in no racing on the Sunday and pulling up stumps after lunch. 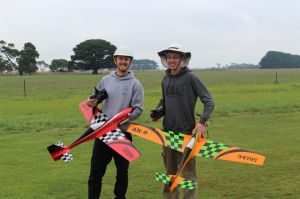 FA1 & F400 classes had a result but Q500 with only 2 rounds completed, was a non-event. It was a pity as we had a good turn-out with Pilots from SA, NSW & VIC. 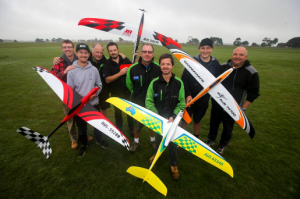 While waiting for the weather to improve on the Sunday morning, a reporter and photographer from the Warrnambool Standard interviewed the World Champ Team plots and took some photos for the news paper. Non-Event – Only 2 rounds flown before being washed out. We now only have 2 more events left for this season’s championship. There was not change for the top 3 positions but Daniel has now closed the gap to Leigh down to 5 points from a previous 12 points. Like FA1, there has been no change for the top 3 places but the gap at the top 2 positions is 2 points. Only 5 points covers the top 3 positions. No change for the top positions as all 3 receive 1 attendance point after this class was washed out. The next race on the calendar is back at Munro on May 20th -21st.